You can manage your OneDrive for Business to see how much space you’re using and free up space if you’re getting close to your storage limit. Note: If you don't have permissions to update storage, contact your site administrator. See Understanding permission levels for more info on permissions. Note: Not sure which sync client you're using? See Which version of OneDrive am I using? 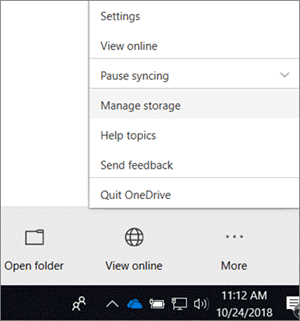 Right click the blue OneDrive icon in the Windows notification area, and then select Manage storage. This opens a Storage Metrics page that shows you the size of each item you're storing, and the percentage of available storage it's using. 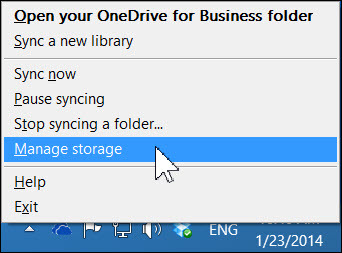 Right click the OneDrive for Business icon in the Windows notification area, and then select Manage storage. If you want to the see how much space you’re using, select View OneDrive for Business storage. This opens a Storage Metrics page that shows you the size of each item you’re storing, and the percentage of available storage it’s using. If you want to free up space, select Open OneDrive for Business Recycle Bin. The Recycle Bin opens and shows you a list of all items you’ve deleted in your library. You must permanently delete these items in the Recycle Bin to free up space for other items. See Manage the Recycle Bin of a SharePoint Online site collection for more info on end user and site administrator recycle bins.